Web Exclusive: Illinois Sixth Congressional District Democratic candidates debate at Clow UFO Base (Fiction) » « From the Webmaster: Do psychology and evolution mix? The Center for Inquiry fired its feline fellows for helping a BuzzFeed reporter write a story about sexual harassment allegations against Lawrence Krauss. 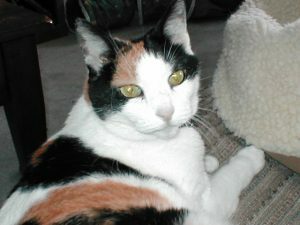 File photo of former feline fellow Cassie. According to CFI documents obtained by the Babbler, the cats, genetically engineered to have a human level of intelligence, admitted to forwarding emails between CFI’s business and finance manager Patricia Beauchamp and then CFI president Ronald Lindsay. The emails were regarding an incident on a cruise. The felines were fired after BuzzFeed published the article. Various sources confirmed that the American Humanist Association immediately hired the felines, and will house them at an undisclosed location. The sources confirm that they will serve as consultants to the Humanists of West Suburban Chicagoland. The secular Jewish congregations Beth Chaverim and Kol Hadash will also contribute to their upkeep. Cassie may be a guest speaker at Secular Social Justice. Both Andy and Cassie will also be guest bloggers at Freethought Blogs and The Orbit. CFI refused to comment for this article. Mayor Claar: We are not buying a hydrogen bomb!